Every drummer should own a metronome, that is the bottom line. Since the job of the drummer is stay in time, it’s no wonder why they need to own one. But how much should they spend on one, and what do they all need? 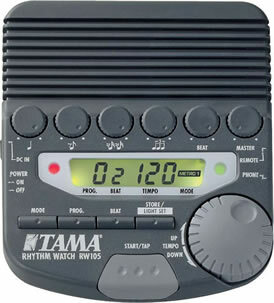 The Tama Rhythm Watch Metronome is a unique design that incorporates many features with an easy to use interface. But is this metronome the drummers best friend, or does it give the drummers a head ache? I take the time to look into this device and explain where it hits and where it misses. At first, you may notice that the Rhythm Watch is rather large, (at least for a metronome). Its design is meant more fore studio and music room practice, and mot too much for the traveling drummer. However, this large size is needed with all that is included with this metronome. The color of this time keeper is rather vintage looking. The light grey is not terrible; however it does make it look like a device of the 1980’s. The manual dial knobs do not help with this image. Of all the digital metronomes out there with slick looking interfaces, you would think Tama would change the look of their metronome. The metronome is designed to be able to mount on your drum stand if you wanted. This is nice, allowing you to place it anywhere on your kit. It also has a flat bottom, meaning you can place it practically anywhere if you are practicing with a pad. The Rhythm Watch has a digital display that shows you the tempo you are playing at , as well as the time signature it is counting at. Very straight forward design that is easy to read, and easy to follow. There are 2 led lights on both sides of the display that keep time for you as well. One is red, which can count quarter notes, or half notes ect, while the other is green which can count all the notes in between. This is nice to have if you are more of a visual type person. All in all, the Rhythm Watch is a decent looking device. If you can put up with an older looking metronome, then you’re in luck, because this device really delivers in other areas! This is where Tama’s metronome really shines – its playback. Obviously it performs all the tasks any metronome does, and that is keeps time with a beep. However, the features that are included are what set this device apart. First off, there are 2 different sounds you can choose from. This makes things a little nice if you get a headache from the constant beep that other metronomes use. With these sounds, come different tones within the beeps. This is nice because you can change time signatures, accents, and more. Most other metronomes will only count straight quarter notes in a constant tone. The Rhythm Watch will actually keep you in the right time signature you use, by accenting the one count on the beat. On the front, you can’t help but notice the 6 smaller dials spread across the middle of the metronome. These are easy to use adjustments that make this metronome one of the best. First off, the dial on the far right is the master volume, very self explanatory. The one right beside that is the Beat dial. This raises to volume of the beat that you have selected it to play. The other dials all work similar to this. When you start your click track, there will be no sound. You are to choose the style of click that you want. This is done by adjusting the different dials. There are 4 different clicks you can choose from – quarter notes, eight notes, 16th notes, and triplet notes. You can also mix and match these. Say if you want an 8th note triplet count, simply raise the volume on both dials. You can have them all turned up; however, it tends to sound rather muddy. There are a certain number of beats that you can play too. This is done by selecting the beat you want with the button, and turning up the Beat dial. There is a Mode button, Prog. Button, Beat button, and Store button on there as well. The Mode button switched your time signature, while your program button allows you to store up to 20 different pre set counts. Very easy to personalize! The best part about this metronome is its’ easy to adjust interface. There is a huge dial on the front right of the metronome that allows you to adjust your tempo very fast and efficiently. Another thing is the volume of the click. I have heard some pretty quiet metronomes; however this one was fairly loud. Being a metronome for a drummer, this only makes sense. The Tama Rhythm Watch metronome is a handy little device. With a quick and easy to set up click track and a volume that you can hear, this metronome is a must for drummers. If you can afford it that is. This little beast may run you upwards of 150$. I would definitely say it is worth it for what it brings to the table; however if you are just looking for a click track time keeper, this may not be for you. Check it out for yourself though, as it is a great machine! Right now, Musicians friend has it on sale for 109.99$, which is a steal of a price. Look below for purchasing info!